Last time in my tutorial i told you about all time window 7 great shortcuts . In today tutorial i show you how to create an invisible folder.Most of the time we required to hide our files and to that we would like to purchase software.In today tutorial i will show you how to made an invisible folder in window 7 without any software.It will keep your data safe and secure only you will know that the folder is Invisible.To do that you only required window 7 and a folder and just a minute so let see how to that. 1.) 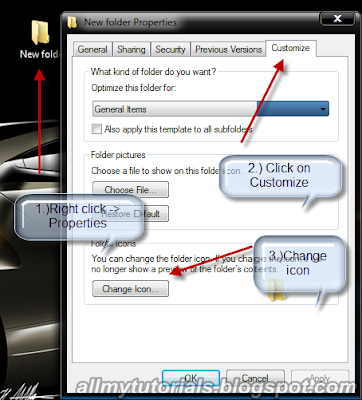 Create a normal folder as you made others folder like by right clicking.After creating the folder right click on that folder and click on the properties. 2.) Now click on customize button and then click on change icon after that browse the library and seek a blank or invisible icon (See image below). 3.) 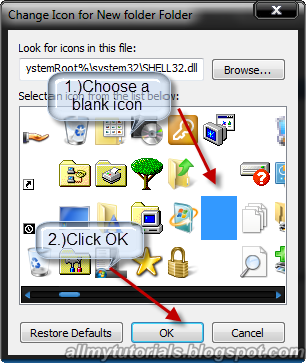 After choosing the blank icon click on OK button now you have a invisible folder but still it have a name. 4.) 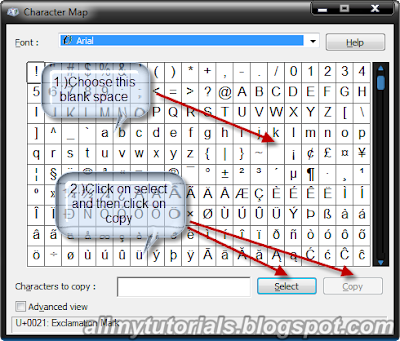 Now in start menu type character map in location box and open it .Now choose a blank space from character map and copy it.once you copy that go to that folder and rename it and paste the blank space using (CTRL+V) command. That’s it now you have one good invisible folder.You can see the image of an invisible folder below the only drawback is that when some one hover mouse hover it a border line will be created in window 7 but in window xp it worked like a charm.Go give it a try. Hope you will all like my post and keep visiting to my blog , if you have any query please leave comment in below comment section i will like to help you and don’t also forget to subscribe to my blog.